Initially, people create flash page flip books as illustrated books for children, as flip book is more capable to bring joy and make book readable than common e-document. But people today think differently, they have widened the applications of flip publications in many industries. People now make flash flip page books to publish newspapers, ordinary books, magazines, catalogs, etc. online, sharing them with readers all over the world. 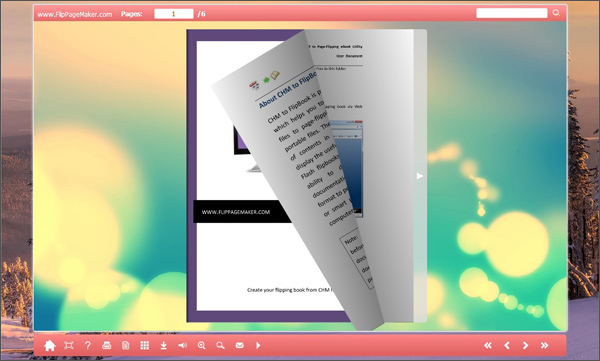 Flippagemaker Flash Flip Book Maker is freeware for turning text (.txt) file to flash page. With the software, you will find that making flip book is pretty easy. Flippagemaker Flash Flip Book Maker is a desktop window application. It provides a lot of options for making free flip book from text. You can set title, book proportions, color, background, sound, and buttons in a user-friendly interface. Now you can have a look at the following flash page book created by Flippagemaker Flash Flip Book Maker. As you can see, the book is designed with a Float template. It has two different outer background image and inner background image. The toolbar color matches perfectly to the template too. The free flip book is of soft cover edition and it retains to center of flash window all the time. Book title and page number box is showing in the top. As many as twelve buttons are lying in the bottom. You can add a link to the Home button, click Sound button to enjoy beautiful music, and click Auto button to play automatically. The flash page flip book shows almost all the feature of the freeware I recommend here. You can also make a flip book like this one in a few minutes.